Bucky Lasek has been competing for 26 yrs now but on the next Pro-Tec Pool Party, he will be seated in the bleachers… A couple of days ago, he suffered an injury while filming for a commercial at Heaven. "I was filming this GoPro commercial up in my bowl," Lasek told ESPN. "And I had cameras all over me so when I felt I was fumbling and tried to save the cameras, landed kind of low and put my foot down and just snapped it." The 38-year-old Pro ended up with a broken ankle due to the accident. According to the medical reports, Bucky Lasek has ended-up fracturing a bone just outside his ankle known as the lateral malleolus bone. It seems it would take only about four to six weeks for Lasek to recover and return to the high level skateboarding. 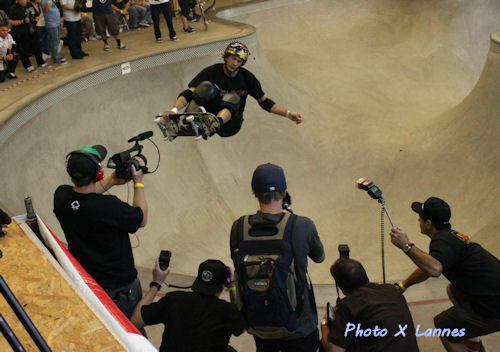 Bucky Lasek was the winner of both the 2010 and 2009 Pool Party events and this year was supposed to bring a fierce battle between Omar Hassan Rune Glifberg and especially Pedro Barros. He recently told Ozzie, from Blue Tile Obsession “I'm pushing 40 and competing against 16yr olds” evidently referring to Pedro Barros without naming him. Pedro Barros is the new whizz kid of bowl riding. It is only his third year at Pro-Tec Pool Party and he is competing against giant skaters with 10 to 20 year bowl riding experience. Bucky Lasek during Pro-Tec 2010. Humm… Does that mean that those 3 guys will most likely not be in the podium??? Bucky Lasek is also one of the big winners of the X Games Vert series with four gold medals at present and 13 X Games medals overall. 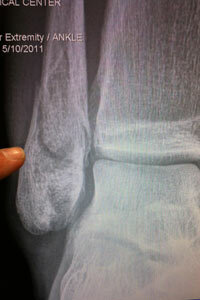 Lasek’s participation in the 17th X Games depends entirely on his recovery from the ankle injury. If his recovery goes as expected, he should be back on board soon and have in plenty of time to compete in X Games 17 scheduled at the end of July.